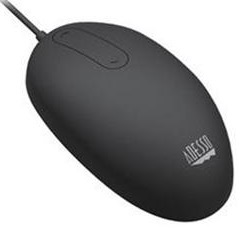 The Adesso® iMouse W2 Waterproof Anti-Microbial mouse is the ideal pointing device for the educational, industrial, medical and maritime industries because it is 100% waterproof and offers unique washing capabilities to eliminate germs and bacteria. The soft touch offers comfort while providing protection from unexpected spills or debris. The mouse provides three scrolling buttons: Up,Down,and Universal Scroll so you can navigate quickly or in sections. Finally,the optical sensor technology keeps the device precisely on point and lets you work on most of glass,wood,marble and leather surfaces without a mouse pad. Then anti-microbial silicon material prevents the growth of harmful bacteria and germs and can be cleaned with soap and water or disinfectants. Sealed with a silicone material overlay, this mouse is 100% waterproof, oil proof and dust proof and can be cleaned with soap and water and other liquid cleaners. Scroll up and down with the touch of one finger. Replace your traditional scroll wheel mouse with the advanced iMouse W2 touch scroll pad. Theoptical sensor technology keeps the device precidely on point and lets you work on most glass, wood, marble and leather surfaces without a mouse pad. 800 DPI Resolution makes this mouse ideal for precise control and navigation.